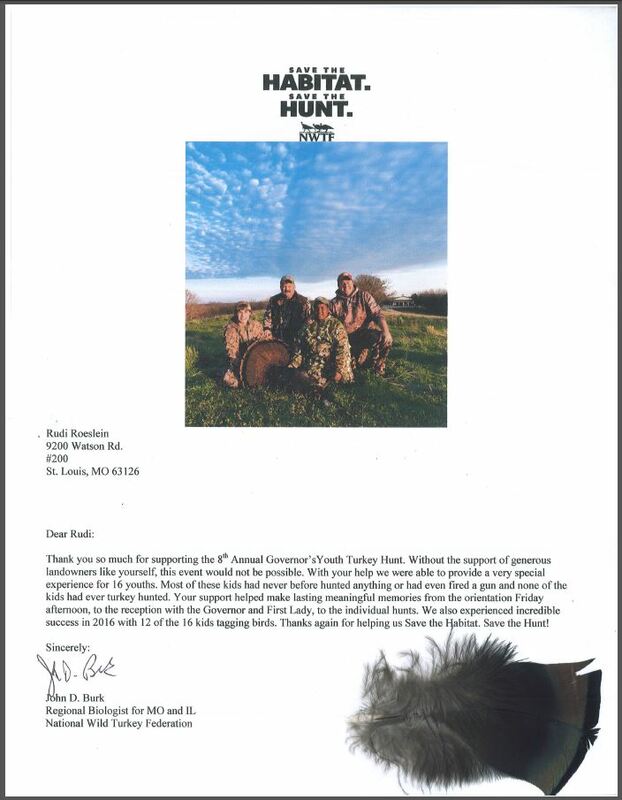 Governor’s Youth Hunt participant hooked for life with the help of Rudi Roeslein. Chris Brown was a successful participant in Missouri Gov. Jay Nixon’s 8th Annual Youth Turkey Hunt. Pictured from left are Brenden Sneed, Rudi Roeslein, Brown and Brandon Butler. Chris Brown had never turkey hunted before. As a sixth grade boy at Fayette Middle School, that left him in a minority. So when he asked me if I’d take him turkey hunting, I didn’t hesitate a second before telling him I’d be proud to. What he didn’t know was my plan included more than just hunting. Governor Jay Nixon has been an incredible advocate for the outdoors during his eight years in office. His list of accomplishments and contributions to conservation, natural resources and state parks is far too long to list in this column. His annual Governor’s Youth Turkey Hunt is a perfect example. To foster a love of hunting and an understanding of conservation in Missouri’s youth, Governor Nixon began the tradition of his annual youth turkey hunt during his first year in office. This year’s event was the 8th annual. As executive director of the Conservation Federation of Missouri, I help host the event. The number of hunters is limited, so an application process is necessary. I felt Chris was a perfect candidate so I encouraged him to apply. The committee agreed and he was selected to be my partner. Our adventure began Friday morning at Bass Pro Shops in Columbia. I outfitted Chris with a camouflage leafy suit and some turkey hunting accessories. We picked up 2-3/4 inch shells, so there wouldn’t be as much recoil from my 12-gauge. We also purchased his apprentice license. The next portion of the experience was spent at the shooting range in Jefferson City, where Department of Conservation staff and National Wild Turkey Federation volunteers helped instruct the youth hunters in calling, judging distance and shot placement on a turkey. Watching kids overcome their fear of firearms under proper supervision is rewarding. After the first shot, when they realize it doesn’t really hurt and a smile stretches across their faces, the kids are ready to shoot some more. After the range we headed to the Governor’s Mansion for dinner. I don’t know if the youth hunters or their parents were more wide-eyed as they stepped into the Mansion. It’s an impressive home with a rich history. It’s a humbling experience to dine with a Governor, as so many others have since the Mansion was completed in 1871. MDC Director Bob Ziehmer, DNR Director Sara Parker Pauley, President of the state chapter of NWTF R.L. Bennett, myself and Governor Nixon all addressed the crowd. Each of us in our own way professed our love of hunting and conservation, while encouraging the youth hunters to enjoy the entire experience, be safe and especially, have fun. Upon conclusion of the dinner, the hunters and their mentors headed to turkey hunting camps all across the state. Chris and I went to Osage County just west of Linn to hunt with Rudi Roeslein, who generously opened his land to a youth he’d never met before. At dawn, Chris, Rudi and I were positioned in a ground blind at the base of a ridge overlooking an agricultural field that had yet to be plowed. It didn’t take long for the gobbling to start. Before too long there were 40 or so turkeys in the field, with more than a dozen of them dragging beards. Chris was transfixed on watching the gobblers strut, while Rudi and I gave it our all to call one out of the field into our set. We were not successful. We could tell Chris was a bit dejected, so both Rudi and I kept emphasizing to him the hunt was far from over. Chris and I went back out at noon. I called a gobbler close, but he hung up just inside the woods at 80 yards. Again, Chris’ face told the tale of despair. As we headed into our last set for the day, we bumped three hens out of the field. I told Chris to hurry up and get in the blind while I set up our decoys. I waited about five minutes before calling. As soon as I did, a hen responded. I called her out to the decoys and she called three gobblers out of the pines. Chris made a perfect shot and our youth hunt ended in success. There is nothing more fulfilling than passing on the love of a personal passion to a youth who will carry that flame forward. For me, nothing compares to sharing my love of hunting and working to develop tomorrow’s conservationists. The Governor’s Youth Turkey Hunt is such an incredible experience for the youth participants. I expect many of them will be hunters for life. 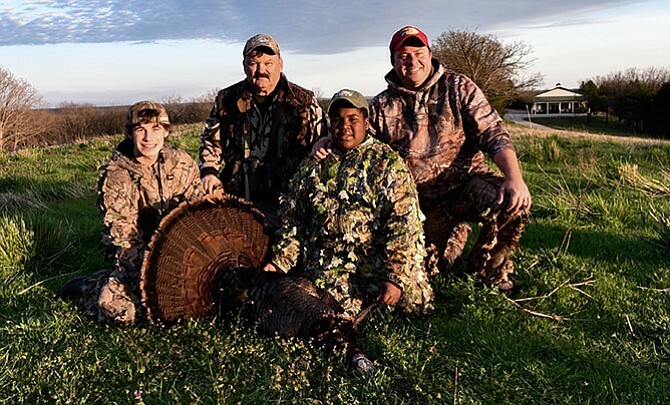 According to preliminary data from the Missouri Department of Conservation (MDC), young turkey hunters harvested 4,145 birds during the 2016 spring youth season, April 9-10. Of the Governor’s Youth Turkey Hunters, 12 out of 16 killed a bird, and they all had turkeys close. Roeslein Alternative Energy Wins 2016 Groundbreaker of the Year Award. Could Restoring Prairie Grasses Improve Water Quality and Reduce Flooding?